The heroic age of building in China which stretched from 1980 up to 2015 and even today, may be coming to an end. China today is a modern consumer economy similar to European countries (or Japan or Korea), with a large middle class, and consumption representing 60%+ of the economy compared to 40% a few years ago. Exports have fallen from 37% of GDP in 2006 to about 17% today, so the impact of potential trade tariffs is less than it was a decade ago. Recently during a visit to Beijing, I learnt from many meetings with senior policy makers in Bank of China, State Administration of Foreign Exchange (SAFE) and China Investment Corporation (CIC), that the senior leadership is very confident that a compromise will be reached with President Trump in the next few weeks and that a trade war will be averted. This could indeed lead to a big rally in share prices both in New York and in Shanghai. One fascinating area of research (and for us of long term investment) is the medical or healthcare field. Joseph Needham in his great work ‘Science and Civilisation in China’ established that almost every medical breakthrough occurred in China 500 years before Europe. Today, we have the uniquely positive set of circumstances whereby many Chinese PhDs from Stanford, Yale and Harvard are returning home and establishing new biotechnology businesses with world class standards, and scientists, involved. Among the companies we have already identified are Jiangsu Hengrui, CSPC and Wuxi Biologics, a major contractor with 240 drugs in the pipeline. Last week, we also visited BeiGene in the Life Science Park 20km north of central Beijing. It already has a capitalisation of US$11 billion with the promise that 3 important oncology products will be approved by the end of 2018. This is a Nasdaq listed company with important US shareholders, such as the Baker Brothers and Hillhouse Capital, other hedge funds, and even Merck. There is no doubt of its quality and of its potential, but to us it is a sign of the future trend in China. More and more biotech companies are coming to market, especially now in Hong Kong where the stock exchange has eased its listing rules to allow start-up biotech companies to list. In the expectation that the trade talks will be settled, we are also optimistic about the technology sector in China. The news that Trump has relented on ZTE is important because it enables Chinese companies in the field of telecommunications and computer software to forge ahead even though China is still woefully short in its own national semiconductor manufacturing production. Another key area of growth in China is domestic tourism. In the first quarter of 2018, 127 million domestic flights took place in China, a growth of about 11.5% from 2017. The expectation is that 550 million people will take flights in China this year, growing to 720 million by 2020. Including train travel, the figure rises to 1.3 billion. There are now 140 airports in China, accounting for most of the cities with over 1 million population. This is one reason we have focused on the hotel sector in our investment portfolio. By contrast, we have avoided the airlines where the advent of low-cost carriers will put pressure on profit margins. I was also interested to discover that at very senior levels, there is a strong focus on Blockchain, and financial technology, in part because of the size of e-commerce and the on-line payment industry. There is a strong emphasis on security among the Beijing leadership; and even though there are very high transaction volumes, it is quite “transparent.” The leadership is also confident about the gradual resolution of the trade issue with GDP growth maintained at 6.5%, money supply at about 12%; and the debt ratio slowing down. Savings are still 45% of GDP, and most Chinese people like to own their own apartments, generally without large mortgages. (One major change could be a property tax, which has been widely discussed.) The government policy is, to open up to foreign ownership, most of the financial sector, including banks, insurance, and fund management; but there is no big rush on the part of foreign banks. The A Share market is generally undervalued, with banking shares under 1 times book, and many technology companies, growing at higher compound rates than their P/E multiples. The Hong Kong-Shanghai Connect has been a successful experience bringing in more capital into China. Now the authorities would like to see many of the big companies, such as Alibaba, which have New York listings, return to China, with the development of China depository receipts (CDRs instead of ADRs). It seems unlikely that Trump’s trade pressure on China will do much to break its rapid progress. In the 10 key sectors highlighted by the government in “Made in China 2025” – IT, robotics, aerospace, ocean engineering, railway equipment, electric vehicles, power equipment, advanced agricultural machinery, new metals and materials, and biotechnology – China is already making rapid progress; and much of the research is now taking place in laboratories in the major coastal cities, attracting some of the top Chinese scientists back from the US to work in good conditions with good salaries. Mr. Market, as Warren Buffet calls him, is getting nervous as interest rates slowly rise, and the Trump administration threatens tariffs on steel and aluminum, and a number of other products imported from China. Although the US/China deficit amounts to US$375 billion, at least 1/3 of that, are products such as the Apple iPhone, created by US multi-nationals, and assembled in China, for re-export (31% of Asia’s sales to the US are technology products). The complex network of suppliers throughout Asia, means that any US/China trade tensions are quickly felt throughout the region. However, our assessment, and that of other informed observers (such as Goldman Sachs) is that the economic impact on China is likely to be modest, less than half a percent of GDP. Only 10% of sales are to the US, and the direct revenue exposure to the US for China equities is only 1%. We have reviewed all our China positions, which are mainly in the domestic consumer, healthcare, education, and tourism sectors, and do not see any impact on our average 25% earnings growth forecast for 2018-2019. The likely outcome is a negotiation, leading to a “managed-trade agreement,” between the two major economic giants, to reduce the deficit over the next few years. We expect some volatility over the summer months, followed by a strong recovery in Asian, and specifically Chinese, equities in the fall. Our China New Era Fund launches April 17th, and we will carefully conserve capital to achieve the best possible purchase price, as we did in India, slowly accumulating long-term positions in companies. Healthcare in China is one of our favourite sectors. By 2050, 33% of the Chinese population will be at, or near, retirement age, meaning 500 million people. 11% of the population suffer from diabetes. The government will spend about 7% of GDP on healthcare, or US$1 trillion by 2020. Medical insurance is expanding rapidly, and there are already 500,000 medical tourists travelling overseas for operations today. Our favourite 3 healthcare shares are Jiangsu Hengrui, CSPC, and Wuxi. Jiangsu Hengrui specialises in cancer and anesthetic drugs and is growing at a CAGR of 20-25%. With a similar growth rate, CSPC has a strong position in generic and innovative drugs as well as the largest global market share in vitamin C and caffeine. The most interesting company is Wuxi Biologics, which is the largest contract development and manufacturing organization (CDMO) in China with 63.5% market share, and is growing at about 70% in net profit annually. Within its pipeline Wuxi has 161 projects in development, 8 in Stage 3, and one of which has just passed the US FDA. We have selected 20 A-Shares, after 2 years of intensive research and close collaboration, with our associates at the Bank of China Asset Management (Hong Kong), out of well over 3,000 listed A-Shares, both in Shanghai and Shenzhen. The A-Share market will become more open to international investors this year, and will also become part of the MSCI Global Index by May, but a passive or index approach to this market, which is 70% state-owned enterprises, with doubtful accounting and transparency, is not a strategy that we advise. Careful stock selection among smaller and midsize companies in less well-known sectors may reward investors over the next 5 years. Just as the FANGS in America have now begun to lose momentum, with the investigations into Facebook, and the prospect of anti-trust or monopoly measures, so, too, the dominant position of Tencent, Alibaba, and Baidu in China may, at least, slow down, but they will not be under the same regulatory pressure as their US counterparts. We also see further growth in the financial sector in China, especially in life insurance, and have selected Ping An and Fanhua as leaders in that field. Our core selection of Chinese equities, in our Bamboo Fund, has delivered almost 30% per annum in total return over the past two and a half years, and we are confident there is more to come in the China New Era portfolio this year. In India, although the market has slowed in the short term, we remain very confident that, looking forward, Prime Minister Modi will be easily re-elected in May 2019, and that his reform program will continue. India’s wealth and savings (32% of GDP) are beginning to become more visible since demonetisation; and there is almost US$2 billion per month of domestic Indian capital being channeled into Indian shares and mutual funds every month. This is a significant shift from the traditional preference for gold, property, and cash. We have also reviewed the generic drug sector in India last month, which has continued to grow rapidly, mainly in sales to the US market; and with the focus on cost containment of healthcare in the USA, these Indian companies are well-placed to benefit. This week, we have reviewed our 9 India private sector banks, and financial shares, and concluded that they have higher earnings growth, lower non-performing loan ratios, and better management than the public sector banks (which they have outperformed by 70% in the past 12 months). With mortgage lending in India at only 10% of GDP, we see great possibilities as India progresses towards the 40% level typical of other emerging markets. Last week, we also made a visit to Vietnam where the economy continues to grow at 6.7%. There are now 22,000 millionaires in Vietnam, and domestic consumer spending is growing rapidly with housing, autos, tourism, and construction all benefiting. Although the Vietnam share market rose 48% last year and 18% in the year-to-date, we are maintaining our long-term commitment to a small portfolio of outstanding companies as part of the Indian Ocean Fund, which is now 50% in Indian midcaps. This portion of the fund continues to perform and we continue to screen, and revisit every company in our portfolio, on a regular basis. Although the US and international background remains uncertain – especially the geopolitical factors, which Washington’s unpredictable policies, and cabinet changes have exacerbated – we believe that the trend towards Free Trade and peaceful resolution of international tensions has not stopped, but will, in fact, be maintained, despite all the current concerns. 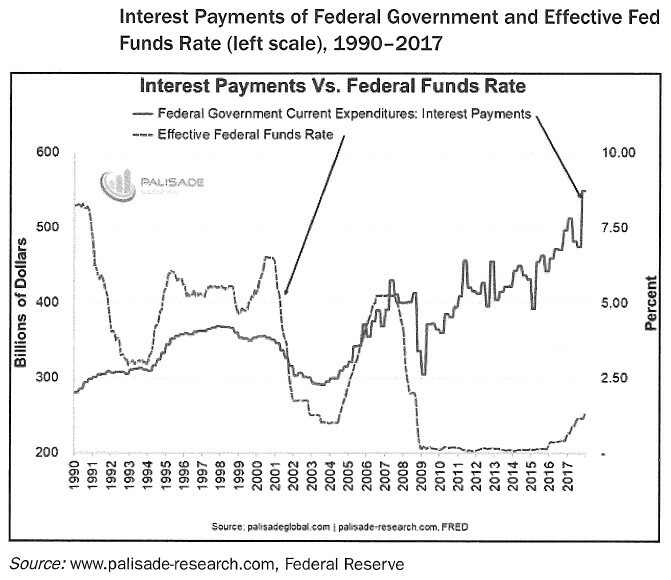 The prospect that President Trump and Kim Jong-un will meet in May must be welcomed as a step towards (in Winston Churchill’s words) “jaw-jaw rather than war-war.” Much more important to the markets is the rise in Libor rates towards 2.5% and the prospect that the US government’s interest payments will rise to an unsustainable level by 2020. We, therefore, conclude that, within two years, there may be a more serious US dollar crisis, for which we need to start preparing. Asia will likely emerge from this crisis stronger because of its current large financial reserves and political stability and demographically favourable factors; but we have to look through the next market downturn and see the opportunities that are arising in the East, especially in fields such as healthcare. Our fundamental approach to investing is a long-term strategy based on the most significant changes in the global economy. Although “technology may be the next macro”, we still believe looking forward to 2030, that India and China will constitute the biggest opportunity to invest in growing populations and rising incomes in Asia, (and we cannot find any parallels in Europe, North America, or the other nations of the emerging world). That is why Lloyd George Management is this month completing its range of three funds with the launch of “China New Era Fund” for international investors. Our objective is to invest in technology, consumer, and medical companies in China, many of which are smaller capitalisation shares listed as A Shares in Shenzhen as well as Shanghai. The headline news at the end of February is that China is going to abolish term limits for the presidency which effectively means that Xi Jinping can continue to be the President for life. This news has been greeted in different ways by the Chinese and Hong Kong press (who essentially support the national effort to clean up corruption and strengthen the country which has been President Xi’s hallmark policy), and the foreign press which is criticizing the emergence of a Putin-like dictatorship. From an investment angle we do not see any significant impact, although it is interesting that the market’s first reaction in Hong Kong and China was to strengthen. At the same time there have been further crackdowns on the most aggressive private Chinese companies making foreign purchases such as Anbang, which bought the Waldorf Astoria in New York, and whose chairman has now been arrested, and HNA, whose shares have been suspended. On the other hand, we see the example of Geely, whose chairman is closely related to the President, and who has personally just spent US$9 billion buying a 10% stake in Daimler. The company already owns Volvo and this has caused some reaction in Europe where Volvo and Mercedes are keen rivals. There is no doubt that China’s ambitions, both military, strategic, and economic, encompass nearly all regions of the world, particularly those in the ‘One-Belt-One-Road’ strategy of Central, South and South East Asia, and even as far as Africa and the Piraeus in Greece. But the imperative perhaps today, is in the field of technology. China is forging ahead in Artificial Intelligence, as well as in solar power, electric vehicles and other key strategic areas, in which, under Trump’s administration, the USA is beginning to retreat from leadership. If we therefore take a neutral view on political developments, we can see that there will be great opportunities in the area of technology in China. Another key area is biotechnology, or the field of Biosimilars, in which Amgen and Biogen have lead in the US. There are a number of Chinese companies in this field and the one which our China analyst team has selected is Wuxi Biologics. We selected this company because we are convinced that with rapid investment in R&D for biologics, Wuxi is the number one contract development, and manufacturing, organization in China, with a 48% market share. Wuxi has 92 projects in preclinical development, and has had a 100% customer retention rate since 2010. The US FDA has recently completed its inspection of Wuxi’s facility for the commercial manufacturing of Ibalizumab for launch in the US. This is the latest stage molecule in Wuxi’s pipeline. If this molecule approved, it will be the first-China-manufactured biologic to be marketed in the US. We also made an interesting visit last month to New Delhi, during which we were reassured that there would be continuity in BJP policies of opening up and anti-corruption, even after Prime Minister Modi. Although we have made a significant investment in private banks and financial groups such as Gruh Finance, HDFC Bank, HDFC Standard Life, ICICI, Oracle Financial and Yes Bank, we have recently decided to exit our investment in the mortgage lending company, Repco Home Finance. This company operates in the state of Tamil Nadu, where there have been contradictory and surprising policy changes from the state authorities regarding building permits, cement production and mortgage lending, which will in our view restrict the potential growth of Repco. We are always conscious of local conditions and regulations as they affect the value of our investments. Although we have been cautious on the Indian real estate market generally, because of the lack of transparency, one exception is the long established Bombay group, Godrej Properties, which has a large land bank and is managed to the highest standards of corporate governance. We have also added a remarkable retail group named Vmart, whose CEO and senior management we met in Delhi last month. We are very impressed by their commitment to financial discipline. In the Indian Ocean Fund, we have reduced our exposure in both Bangladesh and Sri Lanka, and trimmed Vietnam, because of our desire to increase the focus on Indian mid-caps. In the Bamboo Fund, our focus continues to be mainly on China and Hong Kong, which are almost 45% of the Fund. Our Chinese shares have returned over 30% per annum over the last 3 years since we launched, and this gives us the confidence in our selection of 36 key names, half of them A shares, which we will include in our China New Era Fund beginning in early April. This will be a combination of healthcare, technology, consumer, financials and some exposure to the booming travel business in China such as Travelsky and Shenzhen Airport. Our belief is that the A-Share market will benefit from the stable Renminbi, tighter controls of Chinese capital flowing overseas and a cooling property market. This means that the A-Share market at 14x PE, or about half of the S&P 500, presents a compelling alternative for the very large amount of Chinese private savings. In Hong Kong we also see some recovery in the traditional defensive high yield stocks such as HSBC, Hang Seng Bank, China Light and Power and the large property groups such as SHK Properties, which now appear to benefit from the loosening up of the government policy on property development in the New Territories. There are plans to build about 500,000 new apartments over the next decade to counter the present elevated prices for the younger generation, and balance the supply and demand. Hong Kong also appears to benefit from the steady and growing inflow of Mainland capital through the Shanghai-Hong Kong connect, which favours some of these undervalued Hong Kong blue chips. In a meeting with HSBC senior management this week, we learned that 77% of profit is now coming from Asia, mainly Hong Kong and Southern China. In addition to this “back to their roots” pivot to Asia, HSBC is benefitting from rising interest rates, growing trade finance, and the end to a decade of heavy compliance and fines. We expect this year will be a more volatile year than 2017, but as stock pickers, this gives us an opportunity to outperform the growing competition from passive and index products. The future of the world’s climate may depend largely on decisions currently being taken by Asian governments and consumers. The rise in world temperatures since 1980 correlates closely with the rapid industrialization of China (which, like India, depends for 70% of its electricity on coal-based power). In the past 3 years, Beijing has made a massive investment in solar and wind power, in natural gas, and more recently in Electric vehicles. Gasoline driven cars and trucks will be banned in China by 2030. All this is prompted by the serious health consequences of pollution in China’s capital and its environs. Today 55% of world solar output and 30% of wind, is generated in China. The Chinese automobile industry will probably lead in electric vehicle production by 2020, Geely alone making 1.5 million electric cars and trucks: But VW, GM and Ford have also been stimulated by China’s direction, to announce US$5 to US$10 billion capital investments each in EV production. Where China leads, it is probable that the rest of Asia will follow. India is 20 years behind in industrial development, infrastructure, and alternative energy, but will rapidly catch up. The Modi government has made the largest single solar energy investment in the world (58 gigawatts with a target of nearly 50% from renewables); like Africa, it has the benefit of near year-round sunny weather. China has committed to spend US$360 billion on clean energy projects, about 2.5% of GDP, and to create 13 million renewable jobs by 2020. This will include hydro, nuclear, wind and solar, as well as electric vehicles, and natural gas as an alternative to coal. China has a problem of heavy pollution as it emits twice as many greenhouse gases as the United States. While the official standard for PM 2.5, or noxious particles in the air, is 10 micrograms (the World Health Organization), in China the average is 58; in the EU, it is 15; and in the United States, it is 8 micrograms. Although China has improved from the very high levels of 2012, there are still only 25% of Chinese cities which have passed air quality standards; and it is estimated that 1.1 million Chinese citizens have died from heavy PM 2.5 exposure (or 40% of global pollution deaths in 2015). Nearly 40% of these noxious PM 2.5 are from coal, and the government is now trying to cap the coal-fired power plants, and increase natural gas from 6.2% to 10% of energy production by 2020 – converting residences in the northeast of China around Beijing from coal to gas. Wind capacity will be increased to 210 gigawatts by 2020, and solar energy capacity to 250 gigawatts. China dominates the global solar industry, producing 50% of polysilicon, 87% of wafer, 70% solar cells, and 75% of solar modules. China’s own domestic demand is about 50% of total global installations in 2017, followed by USA and India. President Trump’s recent decision to impose a 30% tariff on solar imports from China will have a big impact on the market. (India also has a 70% import duty on Chinese solar cells and modules.) Hydro capacity will grow to 380 gigawatts, but China is going to reach a limit to the number of dams it can create except in the southern provinces, for instance, on the Mekong River which has a big impact on Laos, Thailand, Cambodia, and Vietnam. Finally, on electric vehicles, China has seen rapid growth already of 130% compound annual increase for the past 5 years, followed by Norway, Japan, and USA. China’s demand accounts for about half of global demand and supplies more than 60% of the world’s EV battery capacity. In 2016, electric vehicles accounted for 2% of all automobiles in China, rising to 4% in 2020, and a possible 25% in 2025. The main manufacturers are BYD (30% market share), Geely (15%), BAIC and Zotye. We believe that the best investment prospects are for Geely, which has demonstrated their management capabilities in their successful absorption of Volvo and their ambitious plans to be 30% of the electric vehicle market in the next 5 years. China is also investing heavily into the key commodities for the new batteries, acquiring lithium mines in Chile and cobalt mines in the Congo. India is the second fastest growing renewable energy market, globally, after China, already about 18% of total energy capacity. It has attracted $6 Bn. of foreign investment in this sector. Prime Minister Modi has proposed building new model cities powered only by solar energy. On my recent three-week trip around Asia, which comprised China, Hong Kong, Thailand, Cambodia, Australia, and India, I observed that the impact of China’s investment and tourism continues to be a dominant factor in all the Southeast Asian countries, especially the smaller nations. India has tried to counterbalance China, inviting all the 8 (or 10) leaders of the ASEAN countries to their National Republic Day on January 26. India, under Mr. Modi, is a confident expanding economy which has made great strides to improve transparency and clean up the abuses of the past. In Australia, I observed that the impact of Chinese overseas investment has now rapidly reduced since Xi Jinping’s government tightened up controls on capital outflows. From 2016, when Chinese buyers accounted for 40% of new property sales, particularly in Sydney, this has now fallen to 1% by the end of 2017. Some major commercial developments have been cancelled, such as Wanda’s Sydney office building. The Chinese government announced a year ago, that capital controls were to curb “irrational” overseas investments in real estate, hotels, cinema, media, sports clubs, and other noncore businesses. They are, however, still intent on acquiring strategic industries in technology, finance, energy, and food. 43% of China’s overseas investment goes to the USA, followed by Hong Kong (18%) and Australia (15%). Even London has felt the impact of Chinese investors, both mainland and Hong Kong, in city commercial property, as well as residential units. London presents a spectacle of multiple cranes and large building construction projects, which, however, have generally been decided on, and commenced, prior to the June 2016 Brexit vote. Now there is some sense that the British capital is running “on empty” as the decisions of major investment banks to relocate thousands of their key traders and executives to Frankfurt, Paris and Dublin are increasingly important in their impact on London property and retail activity. Kensington and Chelsea properties are already down 20%-30%. We are in a new era approaching 2020 where liquid securities, such as Bitcoin and easily realizable equities and currencies (but not government bonds, now in a bear market as it passes 2.7% on the 10-year Treasury), are more desirable than real assets such as property. The key factor will be what happens in the currency markets. We continue to believe that the weakness in the US dollar may be a temporary phenomenon, but a generalized crisis of confidence in central banks and leading currencies by 2020, could result in a reversion to gold as a safe haven. We have just done a study of the Chinese gold market. Although the USA continues to hold the largest official reserves of 8,000 tons (out of the total world holdings of 171,000 tons), it is also interesting to note that the largest private gold hoard in the world is in India, with over 20,000 metric tons, followed by China, now estimated at 19,500. 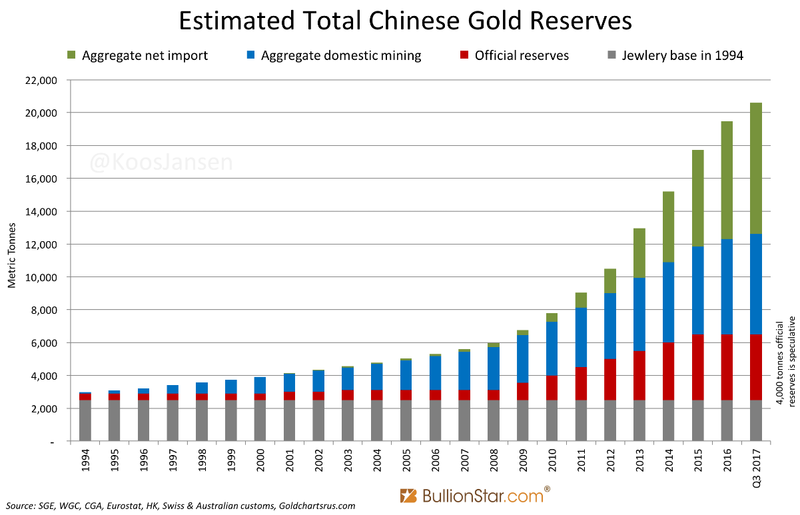 The actual reported gold reserves are under 2,000 tons in the People’s Bank of China, but we estimate that the real gold reserves could exceed 4,000 tons as the Chinese are continuously buying all their domestic gold production, which is nearly 500 tons a year, the largest in the world, ahead of Australia, and also importing 1,300 tons through Hong Kong, in the last reported year of 2016. Since the Shanghai Gold Exchange began operating two years ago, this importation and dealing has rapidly expanded. In addition, as China’s middle class expands and becomes more confident and wealthy and travels more widely, there is a growing demand for gold jewelry. The two listed gold mines, Zhaojin and Zijin, are, in our view, less interesting than the most competitive Australian gold mines, which we have invested in. Finally, I would like to mention to our readers that the Chinese New Year falls on 16 February when the Year of the Earth Dog begins. In the past, this has been a good year for investors, most recently in 1970, with some increased volatility. We are launching our China New Era Fund by the end of March since we believe that the next five years will see a rapid expansion of the A Share market in Shanghai and Shenzhen as it becomes open to international investors and is included in the MSCI Emerging Market Index. We have seen our Indian Ocean Fund rise 30% since launch in December 2016, and Bamboo Asia also growing by 36% over the same period up to 31 January 2018. This is a healthy correction. The markets are pointing to economic strength, rising wages, and (mild) inflation after a long period of slow growth and deflation since 2008. Corporate earnings will continue to be robust after the US corporate tax cut. Asia will be one of the principal beneficiaries, both in exports and domestic consumption (especially in China and India). Free trade has not, after all, been curtailed. The Trans-Pacific Partnership is still alive. After a 40% rise in 15 months, we have a 10% decline; and, in the long run, we see this as a buying opportunity. We are reviewing all our core conviction positions to see if cash flow, earnings, debt ratios, PEs, and yields still justify repurchase today. In most instances, we still see strong profit growth and reasonable valuations on a “Price/Earnings to Growth” basis. With almost full employment, and with commodity prices rising, it is possible that 2018 (despite money supply slowing down) may see the first glimmer of a trend of rising prices. 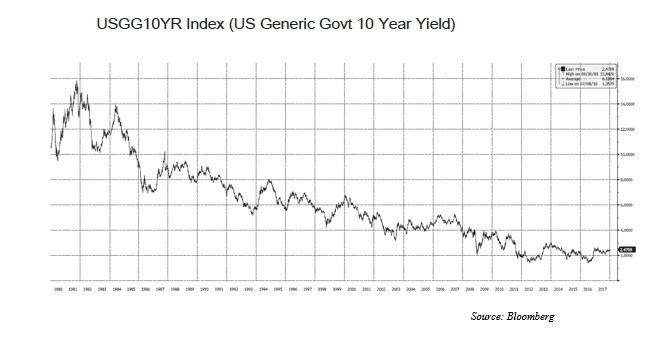 Many investors consider that the July 2016 low of 1.34% yield on 10 year US Treasuries marked the peak of the bond bull market, which has been going since 1981 (and Paul Volcker’s crackdown on 15% inflation). Certainly in Asia, inflation remains historically low, although to take the example of Japan, which has been in deflation since 1990, there is now definitely a positive trend towards higher prices. (Japan’s central bank target is 2% CPI.) And in both China and India, we expect that the interest rate cycle and the inflation trend has bottomed out and will slowly trend upwards (as the Federal Reserve, under its new chairman, Jerome Powell, also expects). In our investment strategy, therefore, we are looking for the most laggard performing sectors of 2017 to surprise on the upside, notably mining and energy. We have recently added Vedanta to our Indian Ocean Fund portfolio: it is controlled by Anil Agarwal and has an excellent diversified portfolio of minerals, including copper, zinc, and aluminum as well as energy assets. We are reevaluating Reliance Industries as India’s largest oil refiner. In East Asia, we see the rise of natural gas as being the key trend towards curbing pollution. While some Australian and international energy companies will benefit, there may also be local beneficiaries: Hong Kong China Gas, Sinopec Kantons and China Gas Holdings. We have confidentially received a recent report, made by a think tank in China, about China’s coming energy crunch, which suggests that domestic oil production in China will peak in 2018 and that China is now scrambling, as a national security priority, to secure overseas energy assets. Part of this strategy is to secure the South China Sea through militarizing the coral reefs and laying claim to the undersea oil and gas basin that may be in that off-shore region. Also, China is rapidly investing in natural gas, both through LNG facilities and building ships, mainly to transport liquid natural gas from Australia and Papua New Guinea. Other suppliers may be Qatari, Middle Eastern, Russian, and Kazakhstan gas producers. Hence the strategic thinking behind the “One Belt One Road” vision of Xi Jinping. It is very much in China’s long-term interests to have secure energy supply and military control over the supply routes, whether at sea or over land (on the Silk Road). 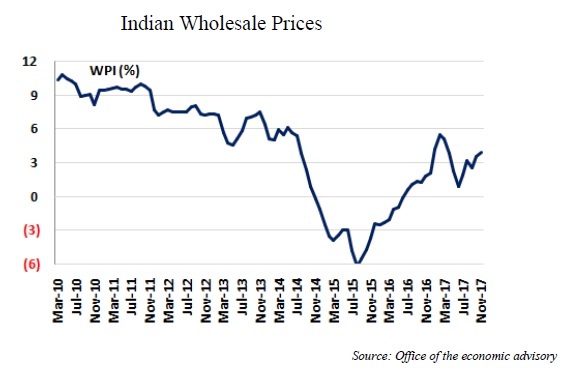 Although we are bullish on Indian GDP in 2018 and the first February national budget, which should be pro-business, we are also concerned about the gradual rise of inflation in India (Wholesale Price Index 3.9% and Consumer Price Index 4.9%). However, despite the rise in oil prices and the strange calm in the gold market, we see the Indian Rupee strengthening against the US dollar. It is now 64, which is the strongest level for over 2 years. We remain confident that despite the possible rise in interest rates to 2.5% in the US, the bull market remains intact, especially in Asia where growth in trade and corporate profits remain strong, and currencies are still well-supported against the US dollar. We are contrarian investors and look for underpriced opportunities in places where other investors fear to tread or where there is a perceived risk, such as the Korean Peninsula (South Korean technology shares are looking very attractive). Our 5-year forecast continues to be that India will be the standout investment opportunity because of its economic and political transformation, which is now being translated into higher economic growth and stronger corporate performance, as well as a strengthening Rupee, under the leadership of Narendra Modi. The economic outlook for the coming year in Asia remains bright, and there are many strong trends for growth and profitability which encourage us in our search for good companies at reasonable valuations. Even India, where the market appears to be on a high P/E valuation, is probably on the verge of a construction boom, particularly in the ‘affordable housing’ sector. In China, too, the fears of a debt crisis or a property collapse have receded and there is every expectation that, even if growth slows to 5%-6%, the private sector and the internet, education, healthcare, travel, and e-commerce industries will continue to grow at an average of 15%. We are actively looking at healthcare and technology opportunities in the A Share markets, especially in Shenzhen. We see 2018 as being a banner year for China, as domestic markets begin to be included in the international benchmarks and the huge store of savings in China flows increasingly into the share markets, rather than property speculation (as Xi Jinping said in October, “A house is for living in, not for speculation”) or overseas destinations. However, one key aspect of our analysis is the impact of disruptive technologies, as the internet has impacted so many sectors: book shops (Amazon), taxis (Uber), hotels (Airbnb), stamps (e-mail), automobiles (electric vehicles), possibly medicine, law, and even politics (tweets). We are increasingly cautious of the risks that disruption can bring to our investment strategy. The area we are now focused on is banks, since the rise of the bitcoin to almost US$20,000 is a symbolic, but strong, signal that blockchain technology has arrived and it will have a deep impact over the next 5 or 10 years on retail banks, investment banks, and even central banks. Perhaps the era of unlimited money printing is going to arrive at a moment of truth by 2020. As one seasoned investor observes, “Bitcoin is a gold disruptor,” and it is surprising to see that gold, which also has a limited supply and is acceptable in all nations through history, has not moved at all, while the new digital currency (is it really secure?) has soared 20 times in a year. But it is surely a banking industry disruptor and although we have a short-term bullish stance on private sector banks in India, in Thailand, in Indonesia, and selectively in Hong Kong and China, we can see, over the next decade, a severe shrinking of the European banking industry. The consolidation in the US has already happened to some extent, and the winners, such as JP Morgan and Wells Fargo, are clear. In addition, in China we have the phenomenon of Alipay and the money market fund, launched by Alibaba, which has already garnered US$230 billion over 4 years, which surely poses a severe challenge to the dominance of the Chinese banks. In a state (and party) dominated economy, however, the outcome is likely to be different. Though Google, Facebook, and Amazon may face monopoly challenges in Europe and North America, it is more likely that Baidu, Alibaba, and Tencent will be “co-opted” by the party to serve the interests of China, Inc. We do not yet anticipate severe costs to shareholders in these companies. Clearly 2018 will differ from 2017 in that the focus on technology will shift to the next phase of consolidation. Also, we are looking (on the “Dogs of the Dow” principle) at neglected and undervalued sectors, such as energy and mining. In India, the scene will be dominated by the approaching election in May, 2019. Two major government policies – “Electricity for All by 2019” and “Housing for All by 2022” – will lead to a boom in construction and infrastructure. Our investment strategy has recently focused on cement, mortgage lending, and property development companies. We expect that GDP growth in India will reaccelerate from 6.3% in the 3rd quarter to nearer 7% next year. The government has indicated that they will simplify corporate taxation by reducing rate and streamlining allowable deductions. Although we believe that the interest rate cycle is near the bottom, the Indian stock market could have another good year in 2018 with favourable base post demonetization, GST and possible recovery in investment cycle. China is experiencing a slowdown, and tightening of monetary conditions, following the anti-corruption crackdown. Paradoxically, this lays the foundation for strong performance in the Shanghai and Shenzhen markets. Chinese exports are benefitting from a recovery in global demand. A consolidation in overcapacity industries (steel, coal, cement, shipbuilding, construction) may lead to better results and clear winners. In the auto industry, for instance, where annual sales reached 25 million units last year, we have identified one winner – Geely – whose sales grew nearly 70% and is aiming to sell 1.8 million electric vehicles per year by 2020 which is more than 30% of the national target. The investment opportunity, as we see it, is very much one of a careful stock selection, both in Hong Kong and China, for the most undervalued growth opportunities. We shall also be scouring the Southeast Asian markets for similar opportunities: our favourites remain Vietnam and Thailand, while Malaysia continues to disappoint. Our Indian Ocean Fund has had a good debut in its first 12 months, rising 17% (despite the cost of having 10% in Pakistan, which we have now exited). The total return on our Indian investments within the portfolio is just under 30% in its first 12 months. Bangladesh, Sri Lanka, Vietnam, and South Africa (only in the Tencent holding Company, Naspers) have all performed well. In our regional Bamboo strategy, we have slimmed down the portfolio to 25 core positions, and, after a year of strong performance, have taken some profits to bring cash levels to 15%. Our core philosophy is first not to lose money, second to re-examine every position regularly to see if anything has changed, “Would we still buy the shares at this level?”, and third, to focus always on our core convictions. Fundamentally, we see that Asia (the 70% core of the Emerging Market asset class) has lagged for several years behind the US market, and in 2017, has begun to catch up, a movement that we confidently expect to continue through the end of 2018. I have just spent some days in Southern China visiting Guangzhou (Canton) and Shenzhen. Guangzhou, population of 14 million, is the capital of Guangdong province, the 80 million Cantonese-speaking province of southern China and traditionally the entryway for foreign traders since the early 1800’s and before. From 1957 the Canton trade fair was also the only outlet for Western businessmen during the Maoist period, and it still continues today. The most fascinating aspect of Guangzhou today is that it has an estimated population of 200,000 Africans (mainly from Nigeria, Kenya, Tanzania and other nations), the largest in Asia, and almost 150,000 Middle Eastern business people from Egypt, Iran, Turkey and other Arab countries. The old trading routes from China to the Middle East and Africa are alive and well with strong exports of clothing, electrical goods, light fixtures, leather shoes and bags, and many other products that are shipped to Africa. Even though China’s factory labour costs have risen to about US$1,000 per month (so that Vietnam and Bangladesh particularly can compete on low cost manufactured goods), China still has a very strong market share, and an excellent distribution system, and will maintain its strong export growth to the emerging countries. When we consider that Africa is going from 1 billion to 2 billion in population in the next 30 years (it will contribute most of the demographic growth in the world over the next 30 years), it is no accident that China has built up such strong links to the African continent, as well as the Muslim world. Going on to Shenzhen, which was a village when I arrived in Hong Kong 1982, is now China’s 3rd largest city with 15 million people, and is expected to overtake Hong Kong in GDP by 2018, was fascinating. We visited some of the high tech companies such as Hytera (a global competitor to Motorola), Han’s Laser (which is a major Apple supplier, for laser equipment components, with nearly US$2 billion of sales, which grew by around 70% from the previous year), Tencent (which sports a market capitalisation of US$430 billion, and demonstrated some of their new AR (augmented reality) and VR (virtual reality) video games of which only one, “Honour of Kings” has RMB40 billion (US$7 billion) annual sales). In Shenzhen one has the impression of a frontier town, with entrepreneurial energy, the ‘silicon valley’ of China, with a lot of bright young people coming in from all the interior provinces creating a very vibrant atmosphere. There are many small technology and medical companies, and the new part of the city resembles Singapore, with green tree lined avenues, excellent road systems and modern buildings and infrastructure. It is like Pudong in Shanghai, but greener – a futurist vision of what China is creating today, and why China is, in both high tech and low tech, a formidable competitor and continues to be a very successful economy, in both domestic consumption and exports, into the developing world. On October 25th, President Xi Jinping led out his new team of 7 senior politburo members. Our analysis indicates that these men demonstrate a combination of liberal economic reform as well as strong party control and ideology (Xi Jinping thought is now to be included in the Chinese constitution). We expect that China’s economic growth may indeed slow to 5%, but that the shift from infrastructure and export led growth toward consumer or domestic demand led growth will accelerate. We are focused on key sectors such as healthcare, education, consumer spending, internet and travel and tourism where we see double digit growth continuing. The Chinese Renminbi is likely to be stable. Reforms of the over indebted SOEs in certain industries such as steel, chemicals, cement, shipping even banks and telecom, (which all have over- capacity problems), will be accelerated and may offer investment opportunities as national champions are identified in each major industry. All together we remain positive about China’s unstoppable momentum towards becoming the world’s major economy, with a growing geopolitical footprint across Eurasia through the ‘One Belt One Road’ initiative, which is already transforming economies such as Pakistan, Belarus, Kazakhstan, Cambodia, Laos, Sri Lanka, and even Ghana and other African nations. The one mistake that western investors consistently make is to underestimate – or even to short-China, its economy, market and currency. We are based in Hong Kong, we have a Chinese speaking team and we believe that on the ground research into Chinese A-Shares will be one of the winning strategies of the next 10 years. In India too, we continue to see consistent reforms being delivered by Mr Modi’s administration. Most recently he has announced US$32 billion of new capital to bail out the state owned banks and their large non-performing loan portfolios. This has resulted in State Bank of India, for example, jumping 23% in a day. Our holdings include HDFC Bank, ICICI, Yes Bank, Gruh Finance and Kotak Mahindra among other smaller financials. These are all well run private sector banks and mortgage companies which we believe will continue to gain market share and reward shareholders. We do not generally want to be shareholders in state owned companies or banks in the major Asian markets because, as minority shareholders, we want our interests to be aligned with those of the controlling shareholder. Japan has also had an important election in the past week, which has given Mr Abe a strong majority to pass his long planned reform of the Japanese constitution. This will allow the Japanese military to be rebuilt and to spend more than 1% of GDP on defense. Coupled with China’s growing military power and spending and the unstable situation in North Korea, (which was a major theme of the Japanese election), this does not bode well for peace in North Asia. However, the Japanese market looks increasingly attractive, and with the Yen at 113 versus the US dollar, corporate earnings are likely to exceed expectations and we see more gains ahead in Japanese shares. In South Korea there has been a period of depressed earnings owing to the Chinese ban on tours to Seoul, which have particularly affected retail, hotels and cosmetics companies. There is some suggestion that this ban may be lifted, and that there could be a recovery in Korean consumer shares. Samsung Electronics also has exceeded all expectations and continues to be one of the leading regional technology plays, along with Tencent, TSMC, Alibaba and Baidu. Unlike the ‘FANGS’, (Facebook, Amazon, Netflix and Google), which are likely to come under more antitrust and antimonopoly pressure from US authorities, we do not see such a risk in China, where the power of the e-commerce sector such as Alibaba and JD.com and the search engines such as Baidu, or the video game sector such as Tencent, are unlikely to be curbed by the Chinese authorities. As investors, we try to take the long view and use the best information available to intuit the disruptive technologies that are coming, and how they will affect the incumbent leaders of industries. In the past decade we have seen an enormous effect already on travel, on stockbroking, on taxis, on hotels and even on education and medicine. The rapid ascent of artificial intelligence is an important theme in our investing universe and China may well be one of the regions where we see this development play out most rapidly. Medical technology also is an area where we expect Chinese research to surprise investors. We have made a number of visits to Chinese pharmaceutical and other medical companies, which are very promising. 2018 is shaping up to be another year of continued growth and performance in the world’s equity markets, driven by the enormous availability of savings and low bank deposit and bond yields, with which equities are favourably compared. Some of the froth may be going out of the high-priced property markets in London, New York and perhaps Hong Kong and the Chinese cities, and some of that speculative capital may be redirected towards stock markets. At least, that is how we are seeing things in Shanghai and Shenzhen. The lure of new technologies and medical breakthroughs will be as exciting in our view over the next decade, as the speculation in property assets has been in the past 20 years. In our Bamboo strategy, we are now 95% invested, as we are in the Indian Ocean Fund, and in the course of redeploying capital we have greatly increased exposure both to China as well as India. The only risks that we currently are monitoring are the external factors such as what the Federal Reserve policy is likely to be under new leadership, whether inflation might re-appear in 2018 and propel interest rates higher, and what is the expected direction of the US dollar? In Asia itself we do not see outsized risks as long as the political leadership remains in place, and the long term reform strategies are followed. In January 2018 we plan to launch a US$100 million China New Era Fund in which we will target a concentrated portfolio of the best A Shares, H Shares, and Chinese technology small cap companies. As we have successfully achieved in India, we believe that a long term horizon coupled with intensive research and local knowledge can pay off for our investors. I was invited to speak in Shanghai on 18 September about our two major Asian Emerging Markets and my experience in investing in them. Since we began, the average annual return in India has been 13.6% in US dollar terms over the past 25 years, compared to 12.9% in China, with the respective economies growing at a nominal GDP 13.5% and 15.2%. What is interesting in the following chart is that today the US market is valued at a 150% of GDP while China and India are still around 70%. For any US or international investors looking at the world today, it must be evident that growth in the next 10 years will continue to come from Asia and specifically from the spending of the growing middle class consumers in the region, which are estimated to reach 380 million in India, 350 million in China and 210 million in other Asian countries, so that 90% of the next billion people joining the middle class will be in Asia (adjusted for purchasing power parity). Part of my bullish forward analysis comes from the fact that many of these middle class consumers are also investors in their own share markets, and that we see, for example in India today, that flows into the capital markets are coming much more from domestic investors than foreign investors. In China there is a shift away from real estate into equities and other financial products. Although both countries have a debt problem, (this is not unique when we think of Europe and the US today), their respective growth rates of 6 to 8% will help them to grow out of this debt. In addition, it is worth reflecting on the fact that the PBoC (China Central Bank) has expanded its money supply by more than the Federal Reserve, the Bank of Japan and the Bank of England combined. One comment that I heard in Shanghai was that the China A-Shares, (the domestic Chinese equities), were receiving “a wall of money” which is supporting the economy and the financial system. The 19th National Congress of the Communist Party of China will be held on October 18th, and will be very important in cementing President Xi Jinping’s leadership, and the reform policy which we expect him to follow. China A-Shares will also be included in the MSCI Emerging Markets Index by May 2018, and we expect a significant capital inflow from international institutions in anticipation of this important change. Both the Chinese Renminbi and the Indian Rupee have strengthened this year against the US Dollar, and we forecast political, economic and currency stability in the next few years. Both Mr Modi in India and President Xi Jinping in China are attacking corruption. This is the “Key-Man Risk” in investing in each nation. The sectors which we select in both markets are similar: internet, e-commerce, consumer, travel and tourism, healthcare and education. Just as in the United States where the technology sector has been leading the market, so too in China there is a highly advanced internet market led by Alibaba, JD.com, Baidu and Tencent. In India, in the ten months since demonetisation, there has been a shift from a 70% cash economy to around 40%, with rapid growth in digital and online payments. India today is at the take-off point where China was 10 years ago in terms of infrastructure, internet, e-commerce and accelerating economic growth. Based on the successful model that we have developed for the Indian Ocean Fund, where we have experienced local advisors in Mumbai, Pakistan and Bangladesh, we have now identified such a partner in China that will enable us to invest capital for our clients into China A- Shares, especially in the small and mid-cap companies listed both in Shenzhen and Shanghai. This is where we see the most interesting investment opportunities for the next decade. China has not collapsed. There is no financial crisis in China. Instead, China is undergoing a gradual deleveraging of its financial sector. As far as we can judge from published statistics, this has been successfully managed by the authorities and confidence has returned to the Chinese market. The RMB is strengthening against the US dollar and foreign exchange reserves have climbed back above US$3 trillion. The money market has tightened. 3 month Shanghai Interbank Rate has risen to 4.43%, and 7-day reverse repo rate to 2.81%: Both the Producer Manufacturing Index and industrial profits are rising gradually. GDP growth is likely to continue at 6% plus in the 4Q, although much will depend on the property and construction sector, which accounts for nearly 20% of GDP. We are planning to launch our “China Hedged Investment” (CHI) Fund in October. We continue to believe that exceptional investment opportunities exist in the healthcare, tourism, education, and internet sectors. In India, there has been some volatility over the summer but the Rupee remains strong and corporate earnings are growing over 15%, especially in the small and midcap sector of consumer goods. Among the losers in August were the public sector banks, which fell 11.6% on news of increased nonperforming loans. It is worth emphasizing that the private sector banks, such as HDFC, ICICI, Yes Bank, among others which we own, have not been so negatively affected. In fact, they continue to report strong profit growth and relatively low NPLs. During the month of August, the Reserve Bank of India also cut its policy rate by 25 basis points, taking the Repo Rate to 6%, in line with market expectations. Inflation is forecast at 3.5% for the next year. The monsoon has been quite satisfactory, and India’s agricultural sector continues to do well. However, the impact of demonetization and the new Goods and Services Tax (GST) introduced July 1st is now visible in the GDP growth falling to 5.7% for the quarter ending June vs. 6.9% in the previous quarter. This may continue into the next quarter ending September. By contrast, the Pakistan market continues to vex long-term investors with its heightened volatility (caused mainly by the political fallout after the Prime Minister’s resignation and a large US fine against Habib Bank): As a result we have reduced our exposure to 6%. Sri Lanka (6.5%), Vietnam (5%), Bangladesh (3%), Mauritius (2.5%) and Naspers in S. Africa (3%) continue to outperform and provide excellent diversification to the core commitment in India. As the US economy continues to be remarkably resilient (3% GDP growth in the last quarter), despite Hurricane Harvey’s impact on energy, agriculture, and insurance, as well as cancelled flights, and disruption in the distribution of food, and other goods due to the floods, this will certainly affect Asian economies, which continue to be dependent on US demand. 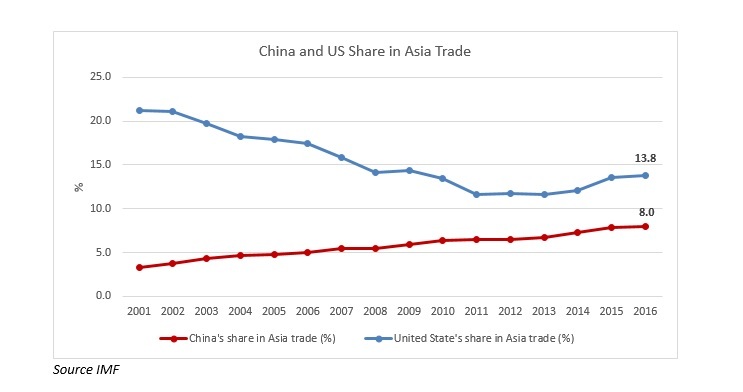 However, China now accounts for 8% of Asian trade. Even commodity prices have strengthened in the past 3 to 6 months. In “The Rational Optimist,” Matt Ridley eloquently makes the case that humanity’s worst fears about the future are not usually realized; that in most fields – medicine, nutrition, education, longevity – human life is improving steadily. The “outliers”, or exceptions to this optimistic assessment of the global economy, such as North Korea, only make it more convincing. Somehow or other, the threat of Kim Jong-un’s crazy behaviour (especially this week in directing a missile over Hokkaido), will have to be neutralized. Asia continues to be a region of extraordinary growth and rapid reduction in poverty (especially in China and India).